December 7, 2018 By Bekki 1 Comment This content may contain affiliate links. My husband tossed his phone and looked at me with tear filled eyes. Thanksgiving evening, he received a text from a trusted friend that a family mentor was in jail after committing a heinous crime. The more we read, the more we sat there shaking our heads. He was so strong in the Lord when our daily lives crossed paths. How did he go from sold out servant for Christ to being faced with the death penalty? 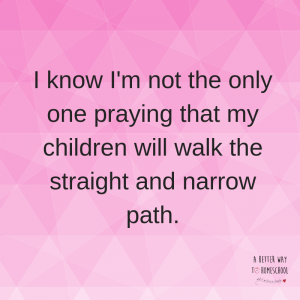 Mama, I know I’m not the only one praying that my children will walk the straight and narrow path. We have wept the deepest sobs over our kids and their walks with the Lord and continually remind ourselves that their eternal salvation trumps their academic education. When we see others fail and fall flat it can cause us to fear. But fear is not from our Lord. What can we do to keep our kids from straying? Don’t despair when I say, “nothing”. Remember that walking with the Lord is very personal and each of our kids must choose to follow Him. It’s easy when they’re little. Don’t panic.God has already set up all the life situations necessary to keep them under His wings. But He also has it set up to woo them back when they stray. Oh, the bitter tears Peter wept when he heard the rooster crow and his eyes locked with Jesus. And then he became a fearless witness for Christ. Sometimes, our failure is exactly what the Lord uses to chip away the last bit of our flesh and to make us ready to be everything He wanted us to be on this earth. I have my own prodigal son. He is walking his own way, doing his own thing, and trying to discover what He BELIEVES. And while my heart breaks and I wish for things to be different… this is exactly what he needs right now. To push against the boundaries and test whether or not the Lord is really there. God is not freaking out. He’s still in control. I have no idea what happened to our old family friend. We shake our heads in disbelief and twist and turn under the question of is this God’s place for him (such as it was for Joseph) or is this his own free will. A lot can happen in 15 years. We’ve all sinned over the past 15 years. All sin is equal in the Lord’s eyes, except denying His Son.I have a scale that measures this sin as small and that sin as HUGE. But God doesn’t.He sees we are either covered in the blood of His son or not. We are either with Him or not. I wanted to let you know I have some fun freebies and deals for you, and I do, but this is so much more important. We need to not stop pouring into our kids. Pray over your kids and with them. In the beginning, middle and end of the story, the Lord is in control. “Teaching our kids from the inside out is the adventure of a lifetime. In Homeschooling from the Inside Out, Rebekah Sayler describes what she called the holy trinity of homeschooling: heart, attitude, and character. Founder of A Better Way to Homeschool, Rebekah knows first hand how focusing on character can make all the difference in the world when raising children. All five of her sons and countless reader’s children have been positively impacted by her Inside Out training. 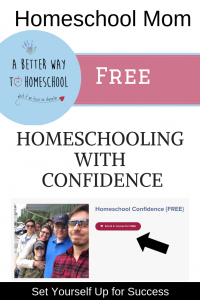 Rebekah details practical strategies to make parents more confident homeschoolers. 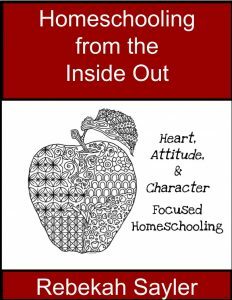 Homeschooling form the Inside Out not only has the power to change a family—it has the power to change the world.